Chantry Flat is far too easy to find. Just turn north on Santa Anita Ave. in Arcadia and go to the end. As usual, parking was up to being lucky, which I wasn't. Found a nice spot a little tilted up onto the cliff, neglected to notice all the "No Parking" signs and got started. The main trailhead is actually down the road a ways past the locked gate. 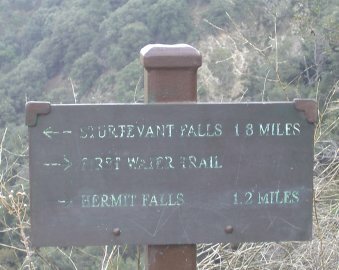 Shortly after the gate, the First Water Trail heads off to Hermit Falls. 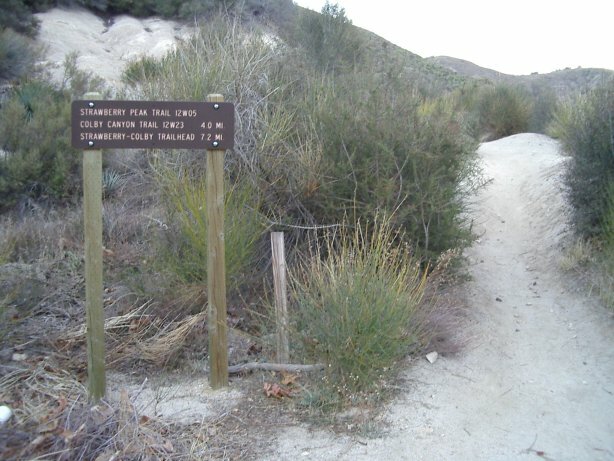 I went down this trail once, but it peters out before really getting to the falls. At the time we hiked directly up the creek a little to get closer to them. Near the bottom of the road is the first cabin of the day and then the footbridge. 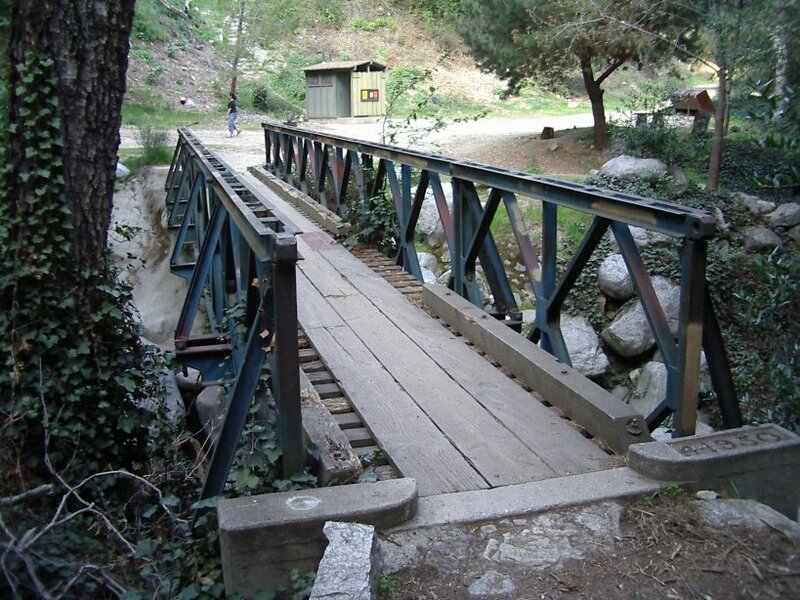 The road ends just beyond this bridge after it takes a ford. Just across the street from the far eastern end of the parking lot at Red Box Junction, where the road up Mt. Wilson turns off the 2, there is one end of Strawberry Peak Trail. From here it is a little over three miles to the top of the peak. The first two miles are very easy ones on fairly level trail that spends about half the time along the southern face of the mountain. First, though, it winds along some telephone poles. What I read of it said this was an old road for the first half mile and it may have been the old utility road but it was not particularly apparent. It also said the trail wasn't signed but it clearly is. The trail followed along the road climbing for a short way before turning into the mountains. Very shortly after starting, I passed a mile marker marked with the number 7. 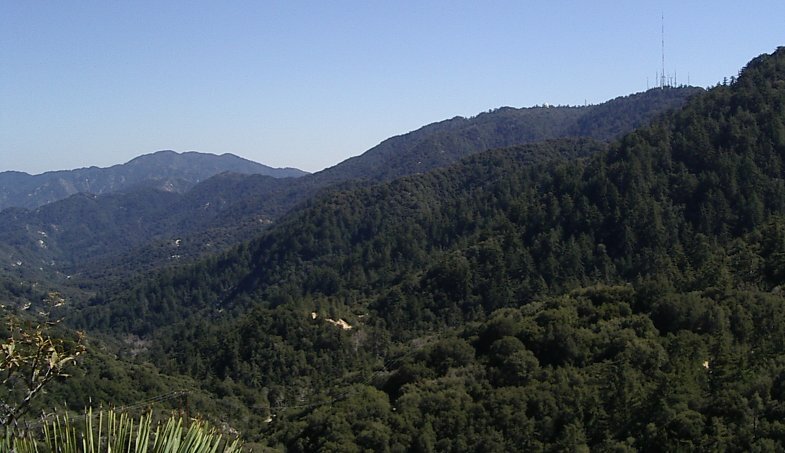 The road quieted completely as the trail found its way to the back of a nearby peak, but the observatory was still easy to spot.